You need to keep your fingers on the pulse of your coaching practice and ensure coach alignment. With Coaching Director, you can standardize your coaching programs and instantly see where any participant is at any given time. You will save significant amounts of time and keep people better informed with the automation of administrative tasks such as notifications and surveying. Do you have one coaching program for senior executives and a different one for people at the director level? With Coaching Director, you can customize each program to your organization’s needs and ensure all coaching meets your standards. 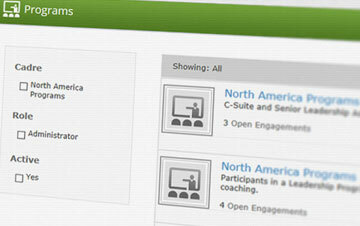 You need access to real-time information and reporting on every detail of your coaching programs. Coaching Director dramatically improves your ability to monitor, track, and report on all of your coaching programs anytime, anywhere. You can set key milestones for engagements in the program, which are then tracked by coaches, providing you an instant picture of engagement status across the entire program. Administrators can make announcements, and share information and documents with members of the coaching program, ensuring everyone is informed, and consistency is maintained.